By most objective measures, employment in the food and beverage sector is good and getting better. Pay rates ticked up an average 4.7 percent, bettering 2016’s hike of 3.26 percent and the highest gain in at least six years, based on feedback to Food Processing’s 11th annual Salary & Job Satisfaction Survey. Yearly performance and salary reviews are still the norm for three-quarters of survey respondents, and almost two-thirds received a bonus, profit sharing or incentive payout last year. We had a total of 458 responses. Anxiety levels are on an even keel. Job satisfaction and security scores are virtually unchanged since 2014. Six in 10 food professionals say they are somewhat or very satisfied with their positions, including one in four who place themselves in the very satisfied category. Job security angst is at its lowest level since 2013, with seven in 10 indicating security concerns are unchanged or lower than they’ve been in recent years. A balance between life and work (or the lack of balance) is a common refrain of workers expressing satisfaction or dissatisfaction with their jobs. One measure of balance is vacation time. Half of survey respondents reported taking all of their allotted time off, with another one in five taking most of it. But another one in five say they left most of their holiday time on the table, including 4 percent who didn’t take any vacation days. An inverse relationship exists between the number of vacation days awarded and the likelihood of use. Among workers receiving 3-4 weeks vacation, one-third indicated they took less than half of the days. Only one individual with 5-6 weeks took less than half; 86 percent took all or most. For those with more than 6 weeks vacation, no one took less than half and three-fourths claimed all or most of their days off. “Amount of hours per week has increased over the last few years; vacations are not feasible due to workload,” wrote a quality-assurance professional who rates herself as somewhat dissatisfied. “The 2.3 weeks of personal time off is not enough to cover doctors, dentists, kids’ functions, weather-related days missed, vacation and mental health days,” griped another. Job satisfaction partly reflects the type of work and the personalities involved. Salary and benefits, appreciative bosses and how challenging the work is have consistently ranked as the most important satisfaction factors, but where they rank depends on an employee’s focus. Respondents were divided into three general categories: front-end business positions such as corporate management, sales & marketing and purchasing (41 percent of participants); production related, including plant operations, maintenance and quality assurance (35 percent); and R&D/product development (24 percent). Business and operations people rated challenging work and salary & benefits as the top satisfaction factors, with almost half from each group naming one or the other. By contrast, R&D professionals put appreciation on par with challenging work, with three out of five ranking them most important. Less than half as many (one in seven) ranked salary as the most important factor, on par with advancement opportunities. Food companies increasingly are outsourcing R&D work, resulting in considerable job flux for in-house product developers. Cognizant of that reality, fewer than three in 50 R&D professionals rated job security as the most important satisfaction factor, about one third as many as those in the corporate and production groups. “Low stress” also was a minor factor in R&D satisfaction, about 50 percent lower than for the other two groups. Workplace rigidity in terms of physical presence and defined work hours is giving way to a more flexible approach, to the delight of many employees. “Management incorrectly correlates presence at the plant with productivity,” an engineer complained. For him and his peers, that’s beginning to change. The lights-out factory doesn’t exist, but a growing number of plant personnel are remotely performing at least part of their jobs. Only 45 percent of operations personnel say they spend all of their work hours on premise. Almost as many spend as much as 20 percent of their time off site. One in eight is mobile even more frequently. Mobility is greater for people on the business side. Less than one-quarter spend all their work hours in the office; 45 percent are off site up to 20 percent of the time. One in five is on site less than half the time, with sales & marketing professionals accounting for two-thirds of that group. R&D staffers exhibit the least mobility, with three in five on site at least 80 percent of the time. Only two of these professionals reported being off site more than half the time. Working remotely and flex time were cited by several respondents to the open-ended question, “What benefits would you like your employer to offer?” Tuition reimbursement and fitness membership garnered more frequent mentions, though a retirement plan in the form of a pension or 401k was the most desirable benefit not currently enjoyed. 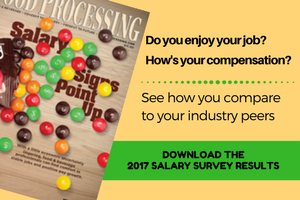 This year’s annual Salary & Job Satisfaction Survey drew 458 food-industry professionals to the on-line questionnaire. After filtering out non-U.S. participants and individuals not employed by food or beverage companies, 286 completed surveys were available for analysis. Nine out of 10 respondents are salaried employees, with the balance paid hourly. Almost half (45.5 percent) supervise 1-10 employees, and 36.7 percent have no supervisory responsibilities. One in 10 supervises 21 or more workers, and 7 percent supervise 21-40. Almost half are employed at firms with a staff of fewer than 250. One-third work at companies with 1,000 or more workers, while one-quarter are at firms with 250-999 employees. Median tenure in the food industry is 15-25 years. Health insurance is almost a universal benefit in today’s food industry, with 93.4 percent of those surveyed covered by their employers’ plans. Dental insurance is almost as prevalent, with 85 percent reporting coverage. Four in five have an employer-sponsored 401k plan, three-quarters receive life insurance, and two-thirds are covered by a vision plan. Fitness membership is extended to one in seven. Considerable uncertainty is being injected into the health insurance market, with the U.S. Congress making several aborted attempts to repeal and replace the Affordable Care Act. How that will affect the overall market is uncertain, but two in five respondents expect employee premiums, deductibles and copayments to increase. One in 10 says a change in insurance carriers either has occurred or is under consideration. One in seven says no changes are likely in their employer plans, while one-quarter allow they are unsure what the impact will be from health insurance changes. Automation is reshaping job requirements, and many companies have made recruitment and retention of skilled workers a priority. Overall, half of food professionals say keeping skilled workers is a high priority at their companies, but there are stark differences between organizations with stable or declining attrition rates and those where attrition is increasing. Where turnover is under control, three in five professionals indicate skilled-worker retention is a priority, more than twice the ratio at firms where attrition is increasing. Low-turnover companies also place a higher priority on retaining all workers, regardless of skill level. At a third of companies with an attrition issue, respondents indicated less skilled workers are easily replaced. Where turnover is an issue, companies are almost twice as likely to use noncompete agreements with either select or most employees. Almost one in four companies with escalating attrition rates makes broad use of noncompete contracts, compared to one in eight firms with stable to declining attrition rates. Keeping a lid on employee churn is becoming more difficult as growing numbers of baby boomers ride off into retirement. While employment specialists forecast 30 percent of the industrial workforce will retire in the next decade, most food companies are sanguine about the challenge: Seven in 10 respondents say their organizations are not adjusting compensation plans to attract replacements. One in seven firms is increasing pay scales for entry-level workers, and one in 16 has enhanced their benefit plans. Five percent have made across-the-board increases in base pay and bonuses, and recruitment bonuses are being introduced or enriched at one in 30. At some firms, the baby boomers can’t leave soon enough. Performance reviews are a tool to encourage older employees to retire or leave, a corporate manager at a snack food company wrote. Those reviews are “excuses to weed them out,” he maintains. That’s the kind of enlightened attitude that pushes job satisfaction levels higher than a modest pay bump will. Can Ingredient Companies Benefit from Disruption in CPG Companies?